1. This briefing paper looks at the effect of introducing the Points Based System (PBS) on immigration control. It finds that the PBS is an ineffective instrument for the task. The PBS gives primacy to “objective criteria” for the issue of a visa rather than immigration control objectives. Student numbers grew rapidly by 100,000 in the first year while, despite the worst recession in a generation, work permits have only fallen by 27,000 or 30%. Temporary: admission to the UK as a student or temporary worker. Time spent in the UK counts towards the five year period required for settlement for a student but not for a temporary worker. Tier 1: Highly skilled Workers. This allows holders to come or remain without a sponsor and look for work. It can lead to settlement. Tier 2: Skilled Workers. The holder is recruited by an employer for a specific job either through intra-company transfer (ICT), the shortage occupation route or after a company has conducted the resident Labour market test (RLMT). Until April 2010 all Tier 2 routes led to settlement; since then the ICT route has not. Tier 4: Students. Granted to students with a place to study at an approved institution. Introduced in 2009. Tier 5: Temporary employment. This is to allow for short term visits such as religious or charity work, cultural exchanges and working holiday makers as well as entry under international trade agreements. For more details on the data and methodology see Annex B. 4. An applicant for a PBS visa is awarded points for certain criteria such as salary and education. If the required number of points is reached then the visa is granted. This is intended to make the process clear and transparent and to ensure consistency. However a survey of UKBA border staff showed that 71% felt it had made the border less secure1. This may be because the evidence to obtain points can be forged (e.g. education certificate) and there are hardly any interviews which can be essential for judging the authenticity of the applicant. For example, students need 40 points. 30 points are obtained if the college offers a place (by issuing them a Certifcate of Acceptance of Studies) and 10 points are awarded for having enough maintanence funds. The college has a financial interest in offering the place and there is no interview to check that the applicant has a genuine interest in the subject matter of the course, has the required English language skills and intends to return when it ends. 5. Graph 12 below shows the number of main holders given leave to enter for work. 6. 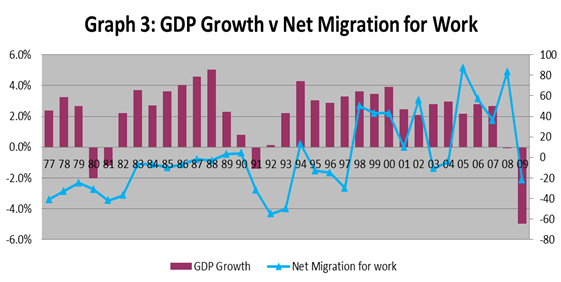 Graph 23 below shows GDP Growth for the UK against net migration. During periods of low or negative growth, such as the mid-70’s, the early 80’s the early 90’s and 2008/9 net migration fell sharply. 7. 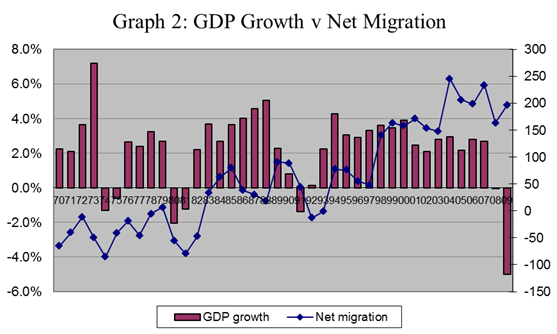 The relationship between GDP growth and net migration is further demonstrated by looking at the International Passenger Survey (IPS) at those who migrated either because of a definite job or to look for work. These two categories are grouped together and shown in graph 3 below. 8. Graph 44 below shows the numbers of highly skilled visas issued since 2006, the start of the Highly Skilled Migrants Programme HSMP (a precursor to PBS Tier 1). 9. Numbers in this category have increased each year since its introduction. This growth has continued under the replacement of HSMP with PBS Tier 1. It seems that these numbers have been less affected by the recession, although the rate of increase has fallen. This suggests there are strong immigration pressures in this category, perhaps because the visa holder is not obliged to work in a skilled occupation from arrival but must do so if seeking a renewal after two years. According to Home Office Reseach5 29% of a sample were found in unskilled work and a further 46 % were either unemployed or provided insufficient details. 10. There are also a significant number of people extending their leave to remain by switching to a PBS Tier 1 visa through the Post-Study Route which allows a graduate in any subject from more than 600 UK institutions the right to stay in the UK for two years and look for work, whatever the class of their degree. In 2009 34,000 graduates switched onto the Post-Study work visa. Prior to the PBS there was the International Graduates Scheme but it only allowed graduates to remain for a year rather than two years under the PBS route. 11. In the second half of 2007 the “Student Visitor” visa was introduced as an option for courses of less than six months. Before then all students, regardless of the length of course, entered on a Student visa. We have therefore grouped all student visas together to show the trend in numbers over time6. In 2009, the first year after the introduction of PBS Tier 4 visas there was a massive jump in student numbers to 468,000 (main entry). 12. “Student Vistors” are not, technically, migrants as they come for less than a year but, if they fail to return home, they contribute to the pool of overstayers. It is, however, worth trying to separate out short term students from students who are in the UK for longer. In graph 4 below it has been assumed, on the basis of the proportions in 2008 and 2009, that 40% of the Student visas issued before the introduction of the Student Visitor category were here for short courses. 13. Graph 6 shows that from a low in 2005 student numbers have been steadily rising with a higher rate of increase in 2009, the year PBS Tier 4 was first introduced. This increase in student numbers has made a contribution to net migration to the UK in recent years. 14. 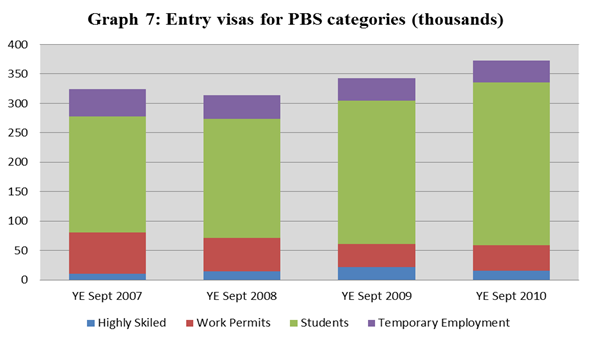 Graph 77 below shows the breakdown of entry visas granted for PBS categories between the year ending September 2007 and the year ending September 2010, the date of the latest available statistics. It shows that the number of entry clearance visas increased in the year to September 2010. A more detailed breakdown of the visa categories is given in Annex A. 15. The overall number of visas issued has continued to rise since the introduction of the PBS, despite the recent recession.This has been driven by student numbers which have been increasing in recent years and have shown a faster rate of increase under PBS. Entry for work was in decline before the introduction of the PBS and has declined further since, mostly likely because of the economic downturn. Initial evidence suggests, therefore, that the PBS has not been effective in controlling immigration. This seems to be implicitly recognised by the Coalition government who have introduced a cap on the number of work permits as they pursue their objective of getting immigration down to the tens of thousands. Table 1: Entry clearance visas issued between 2007 and 2009 (for each calendar year). In addition to the visas issued under PBS there are other work or study visas currently available: Permit Free Employment, Student Visitors for those students staying less than six months and UK Ancestry. 2. The migration data has been taken from the Home Office Control of Immigration publications. This is published quarterly and has evolved so that the information has been differently presented in each issue. For entry to the UK there are two points of data collection. These numbers vary for three reasons: not everyone issued with a visa uses it to come to the UK; a visa issued in one year might be used in the next year and non-visa nationals can enter the UK under certain criteria without the need for to obtain an entry clearance visa in advance such as a American national entering as a Student Visitor. 3. A longer series, back to 2000, was readily available for passengers given leave to enter the UK. This covers more passengers than the data for visas issued so this data was used to examine recent trends. 4. To implement the temporary cap the government is using the Entry Clearance Visas Issued8 The data for the last few years on entry clearance visas granted contains a more detailed breakdown of visa categories. Entrance clearance data was examined back to 2006, the year the HSMP was first operational.